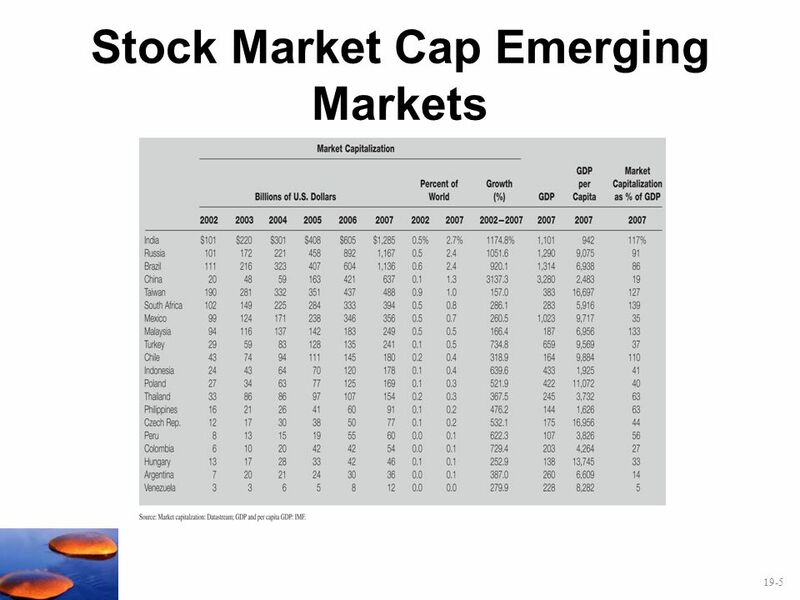 Look at growth of non U.S. markets. The major point here is that investing only in the U.S. omits an increasingly large and important part of the possible risky portfolio and sticking only to the U.S. is likely to lead to under diversification. The so called home country bias still exists. 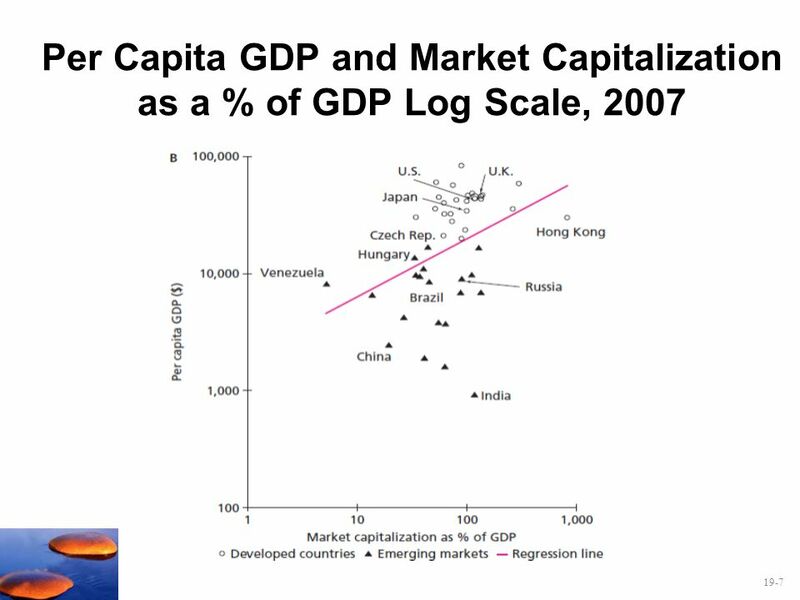 The top four are the BRICs (Brazil, India, Russia and China) that are sometimes categorized separately from the rest as having more growth potential and political clout. China’s market grew by more the 3,000% between 2002 and Active strategies will want to include investments in these high growth countries. 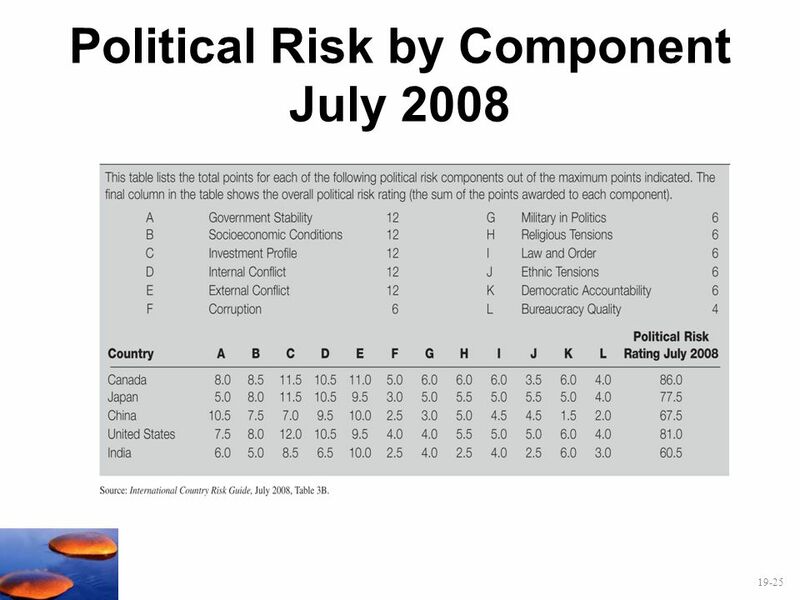 Standard deviations indicate that currency risk is quite high. 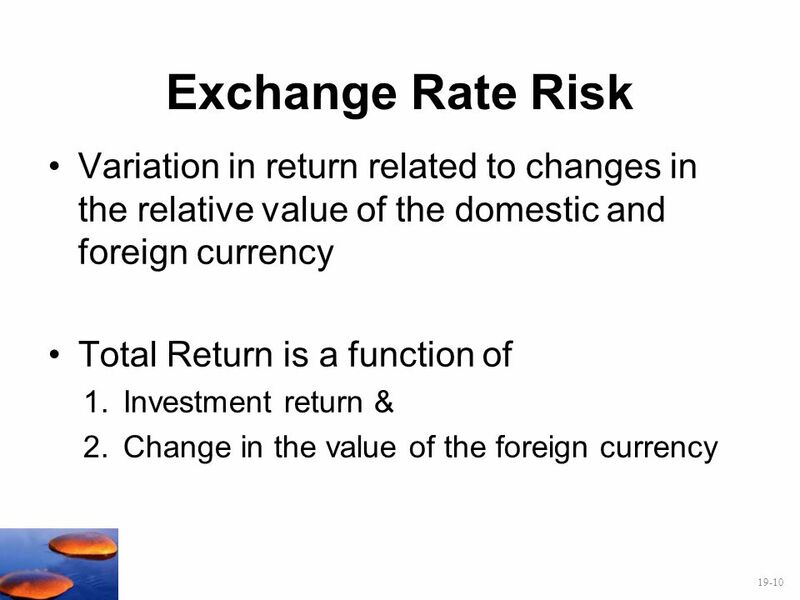 Exchange rate risk is roughly the same magnitude as the standard deviation of stocks. 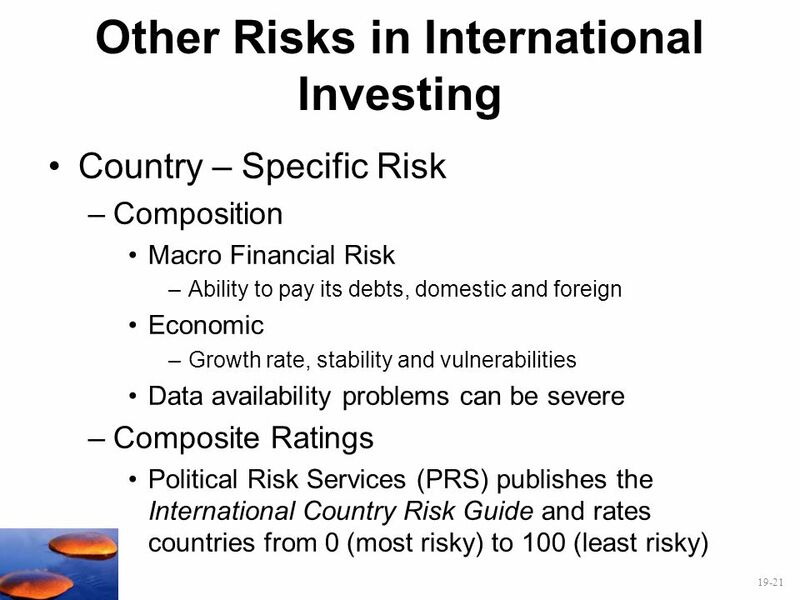 The point is that if you find an undervalued foreign security and invest in it, you should hedge out the exchange rate risk unless you also have a favorable foreign exchange forecast. 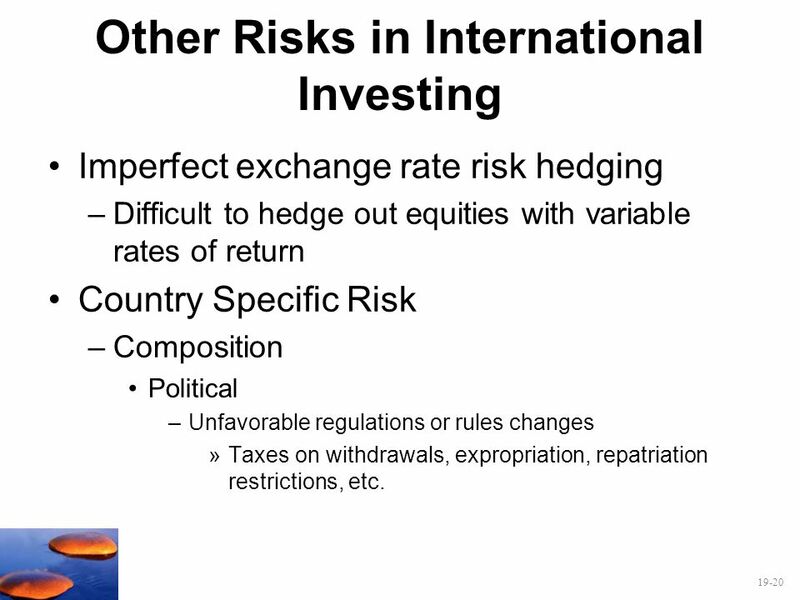 Active managers should consider exchange rate risk. 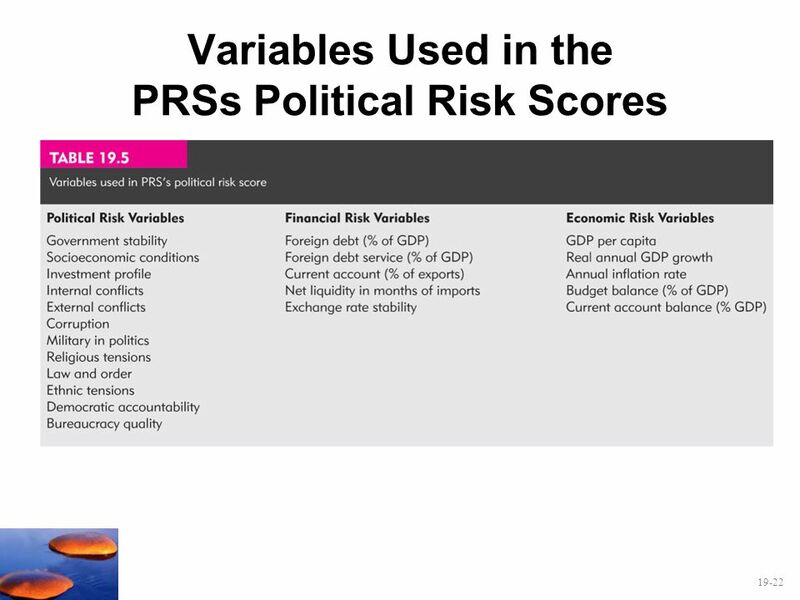 However the low correlations indicate that much exchange rate risk is diversifiable. 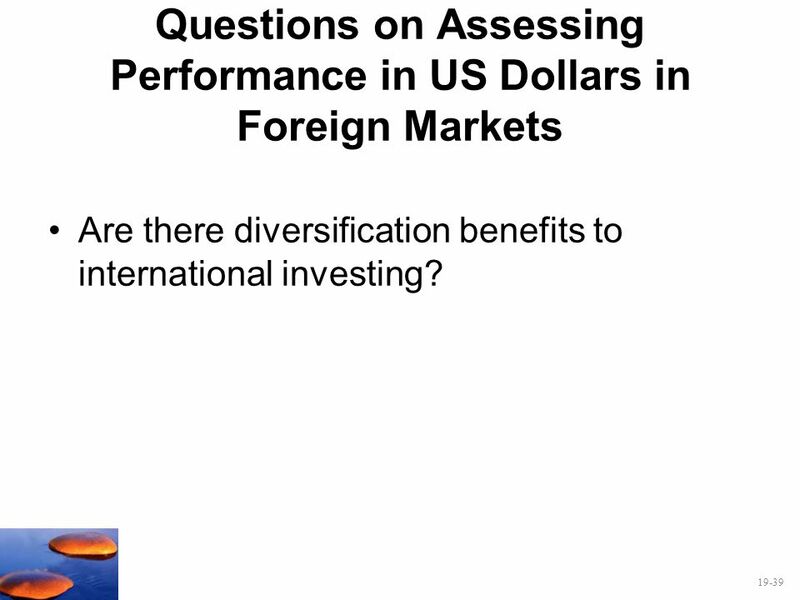 Thus passive investors with well-diversified international portfolios need not be overly concerned with their foreign currency exposure, at least if you have a longer time horizon. 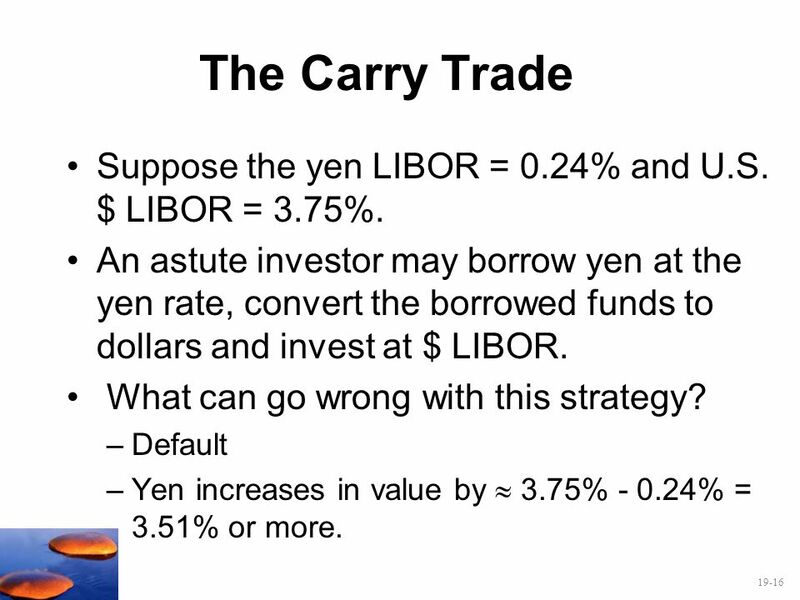 16 The Carry Trade Suppose the yen LIBOR = 0.24% and U.S. $ LIBOR = 3.75%. An astute investor may borrow yen at the yen rate, convert the borrowed funds to dollars and invest at $ LIBOR. What can go wrong with this strategy? Default Yen increases in value by  3.75% % = 3.51% or more. 3.51% is an approximation because these transactions aren’t linear. The carry trade was profitable with the yen for several years but began to unwind when the yen started to rise as U.S. financial problems began and some investors fled to the yen for safety, driving up its value. The weakening of Japan’s economy in 2009 brought the yen back down. The term carry trade is not in the text. U.S. interest rates are 6.15% and British interest rates are at 10% when the exchange rate is $2.00 / £. The one year forward exchange rate for the pound is $1.95/£. How can you earn a riskless arbitrage profit based on these quotes? 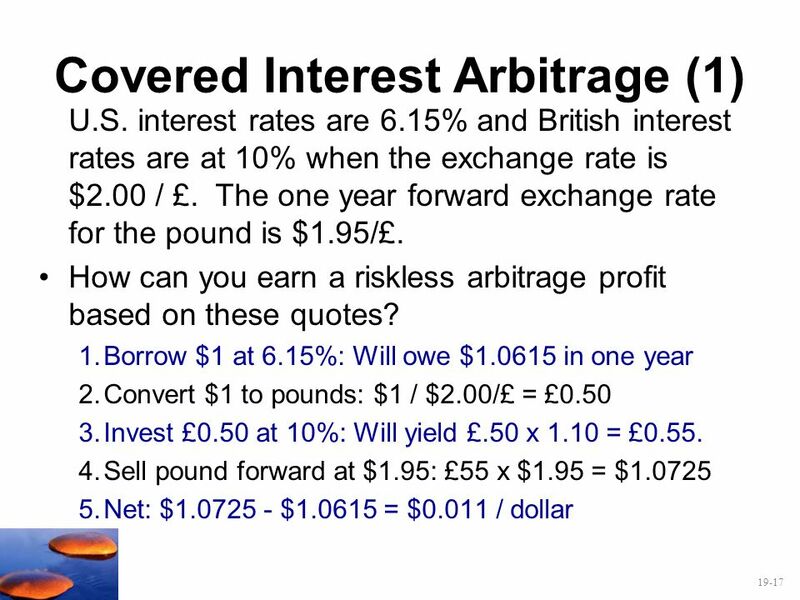 Borrow $1 at 6.15%: Will owe $ in one year Convert $1 to pounds: $1 / $2.00/£ = £0.50 Invest £0.50 at 10%: Will yield £.50 x 1.10 = £0.55. 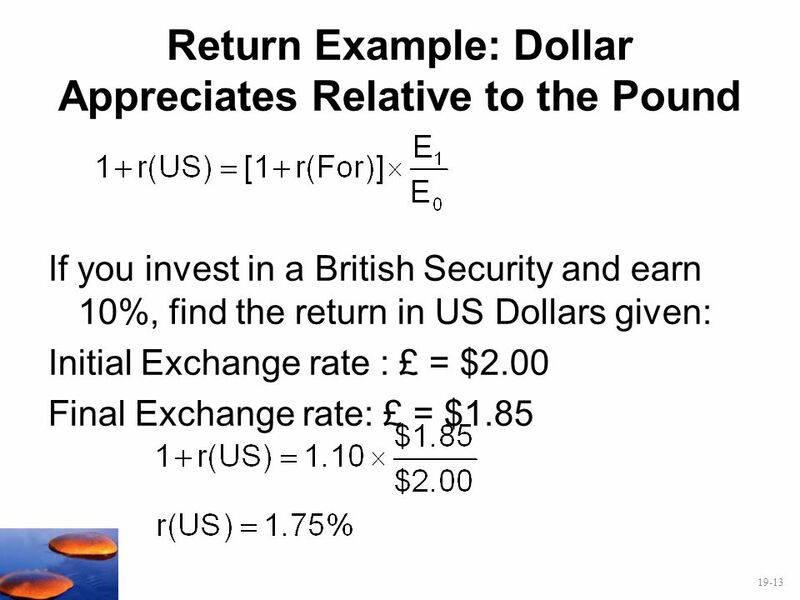 Sell pound forward at $1.95: £55 x $1.95 = $1.0725 Net: $ $ = $0.011 / dollar This works because the currency % change is ($ $2.00) / $2.00 = -2.5% (pound depreciation) is not enough to offset the higher British interest rate. In doing so we gain 10% % = 3.85% on the interest rates and we lose on 2.5% on the currency depreciation. It is riskless if step 3 and 4can be done simultaneously. U.S. interest rates are 6.15% and British interest rates are at 10% when the exchange rate is $2.00 / £. The one year forward exchange rate for the pound is $1.90/£. How can you earn a riskless arbitrage profit based on these quotes? 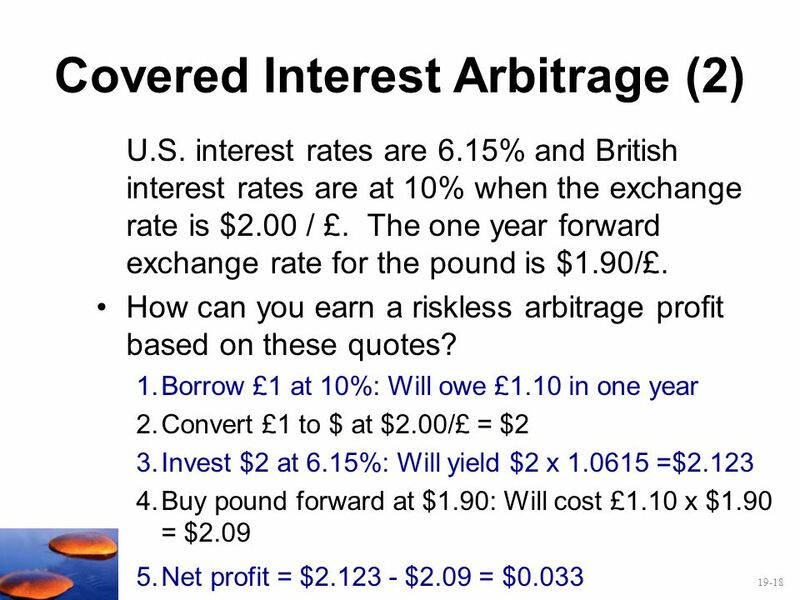 Borrow £1 at 10%: Will owe £1.10 in one year Convert £1 to $ at $2.00/£ = $2 Invest $2 at 6.15%: Will yield $2 x =$2.123 Buy pound forward at $1.90: Will cost £1.10 x $1.90 = $2.09 Net profit = $ $2.09 = $0.033 This works because the currency % change is ($ $2.00) / $2.00 = -5% (pound depreciation) is more than enough to offset the higher British interest rate so we borrow at the British rate and invest in the dollar. We lose 6.15% – 10% = 3.85% on the rates but we gain 5% in the drop in value of the pound. 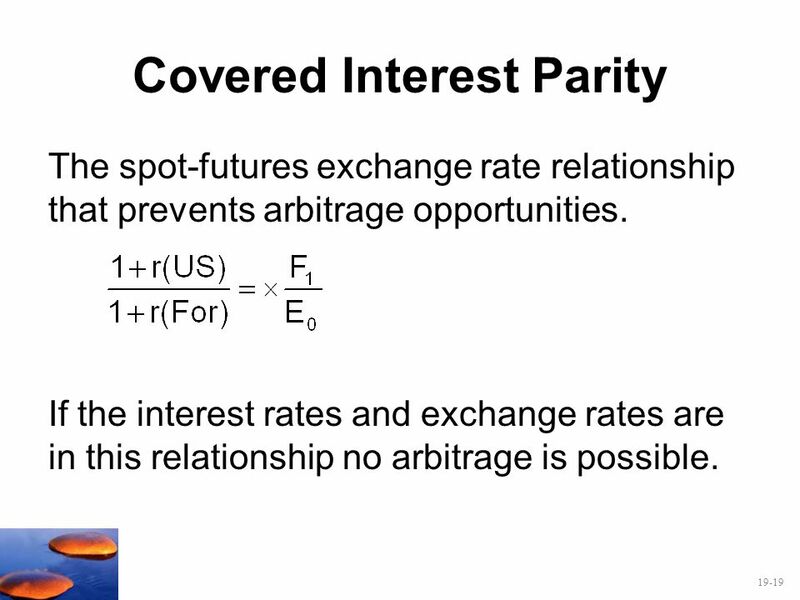 The spot-futures exchange rate relationship that prevents arbitrage opportunities. 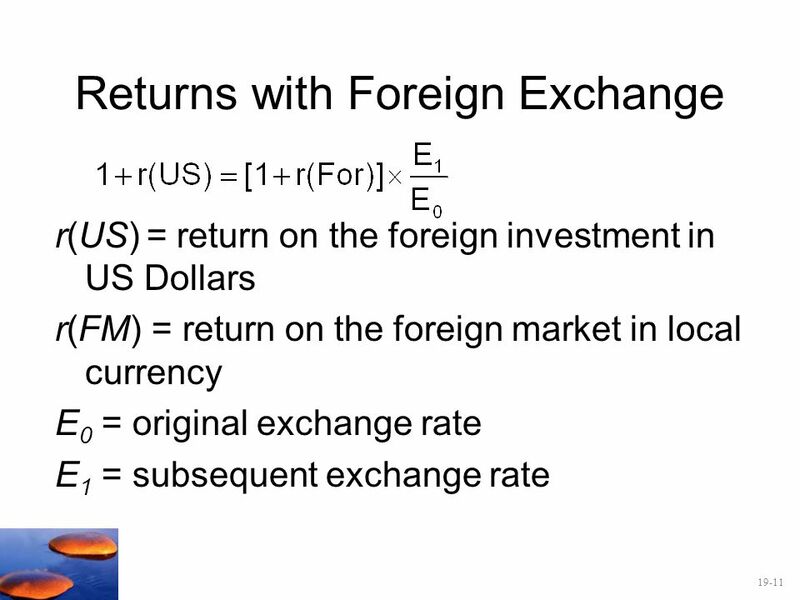 If the interest rates and exchange rates are in this relationship no arbitrage is possible. The intuition here is that the difference in interest rates is just matched by the difference between the forward and spot rate so you can’t exploit the lower interest rate. 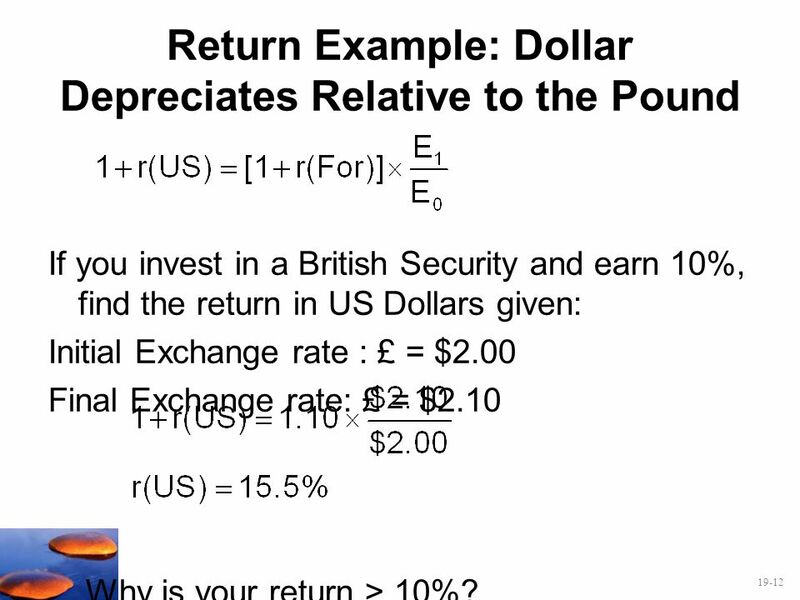 If the U.S. rate is higher then F1 < E0 implying that the dollar is depreciating. The converse also holds. 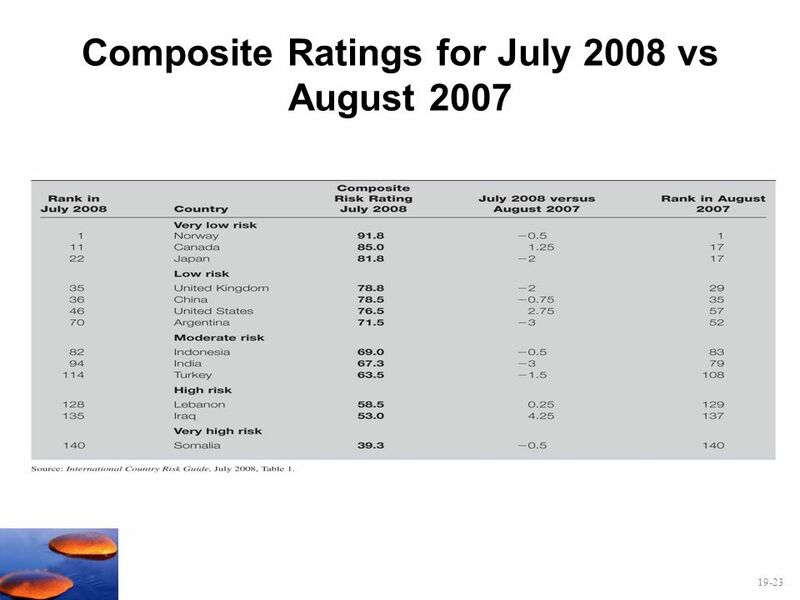 Covered interest parity does tend to hold because this is how banks set their forward rates. 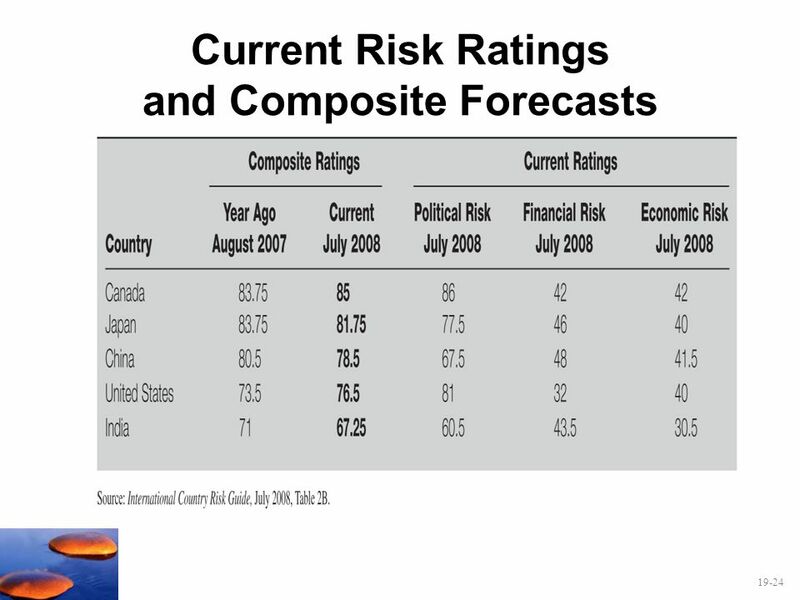 Are emerging markets riskier? Attempt to answer this through the graphs that follow. 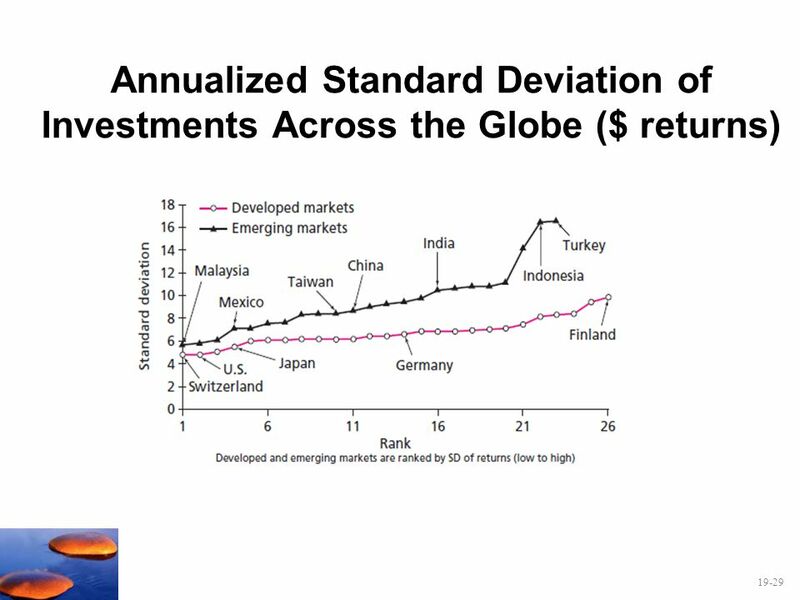 According to the standard deviation investments in emerging markets are generally riskier than in developed countries. 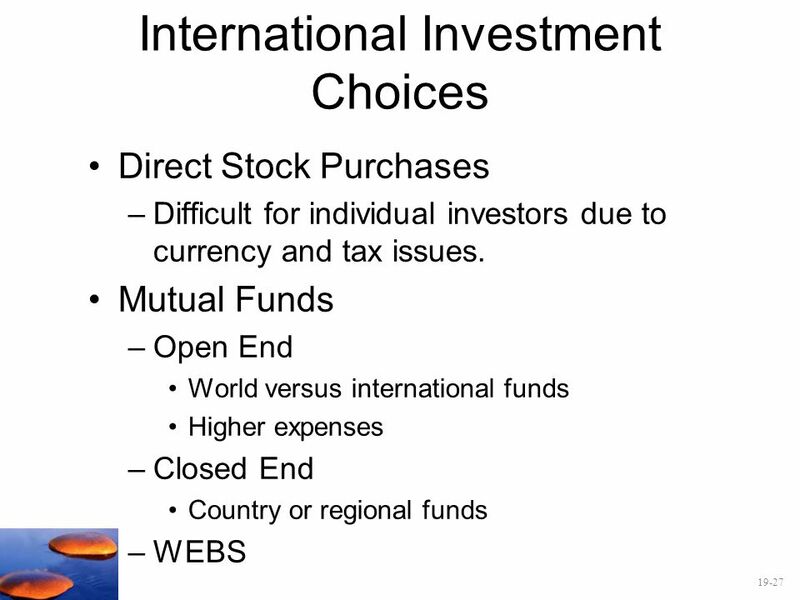 If we are adding international investments to a well diversified portfolio it is beta that matters. Notice the imperfect correlation between standard deviation and beta. 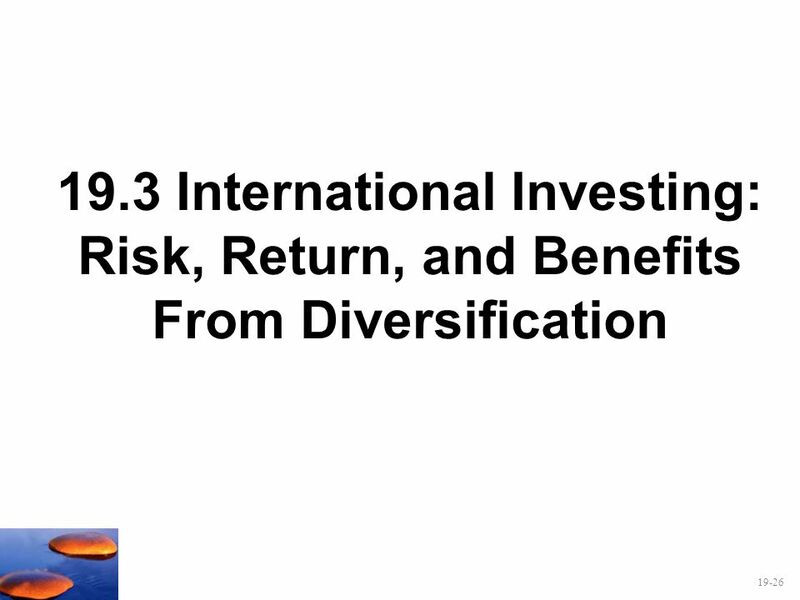 The evidence of lower betas indicates that there may be diversification benefits from including international investments into a U.S. portfolio. 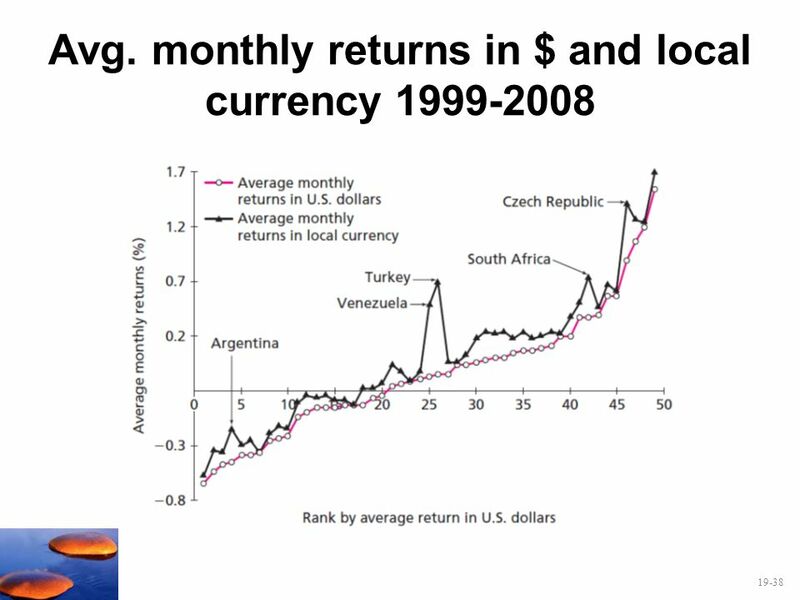 Are average returns higher in emerging markets? 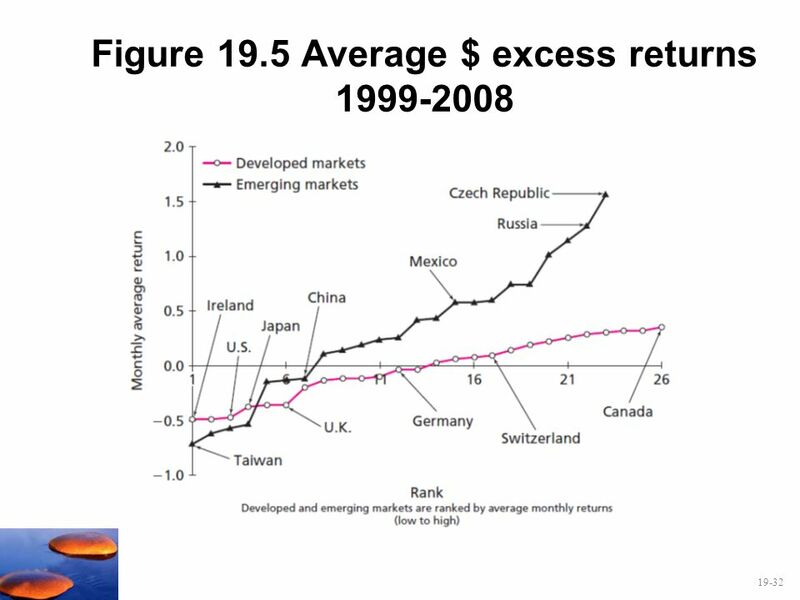 Emerging markets generally have higher excess returns. Since some had returns below the risk free rate we can reaffirm that risky returns may fall short of expectations over long time periods. 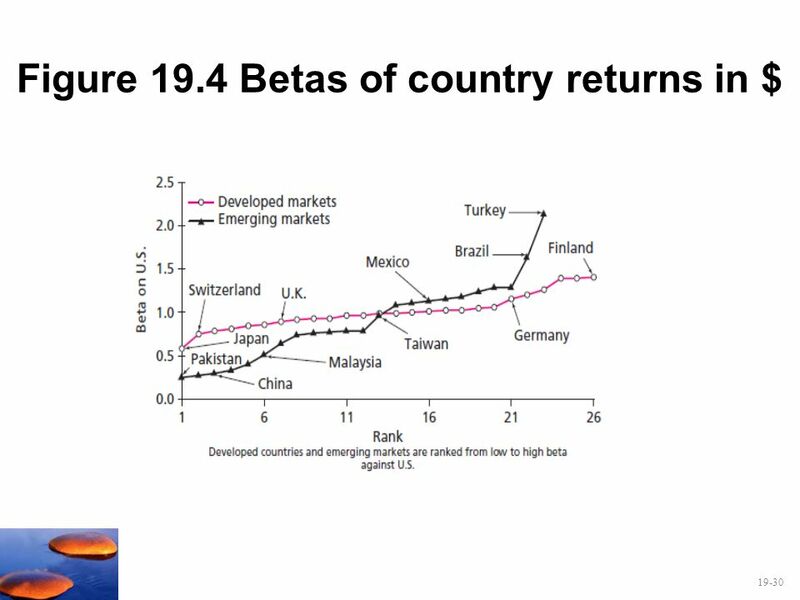 Students may notice that many countries with lower beta had higher excess returns. This seems counterintuitive. Either the betas aren’t good risk measures or we simply don’t have enough data. The standard deviations are large enough to indicate a lot of variability in results can be expected over even a 10 year period. This is for the whole sample of 49 countries but it is broken out different ways. The main findings are that beta and size are significant and the text indicates that investors pay more for securities in markets that have more transparency, enforcement of business law and better regulations. The World Bank published a similar finding about growth several years ago. 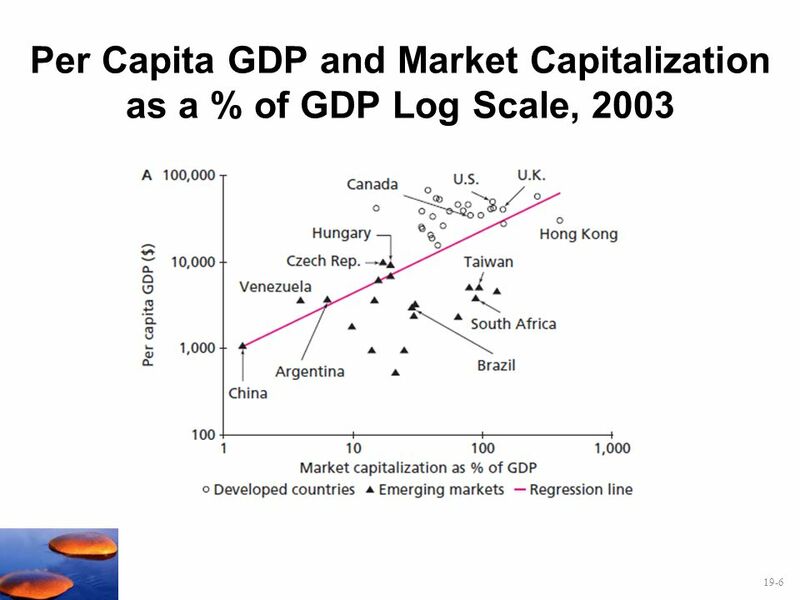 Note that the correlation between country capitalization and SD is high so it may be difficult to say much about these coefficients. 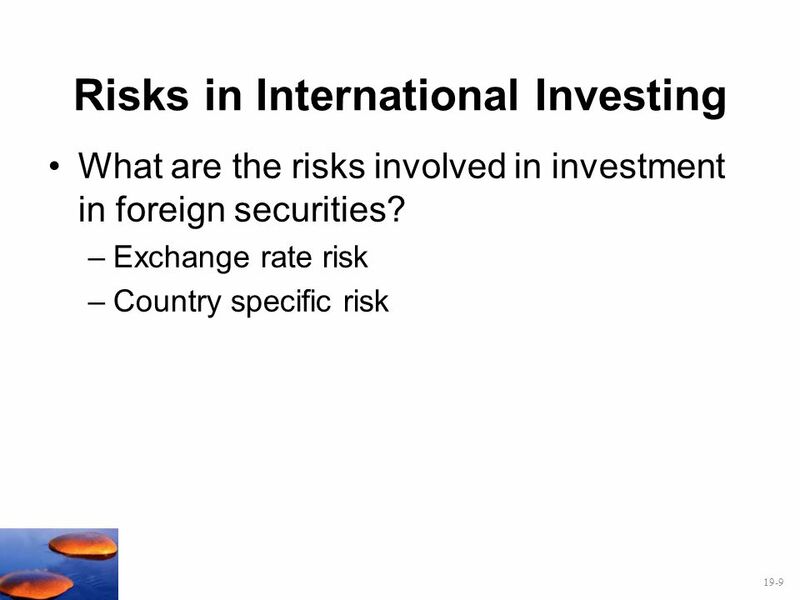 Is exchange rate risk important in international portfolios? 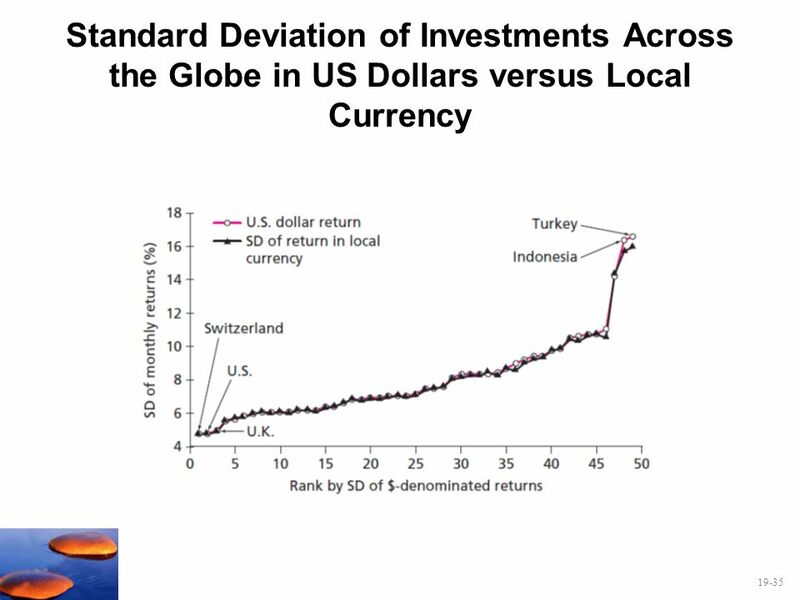 Local currency SDs are slightly lower than SDs of dollar returns, so there is only a small amount of exchange rate risk. 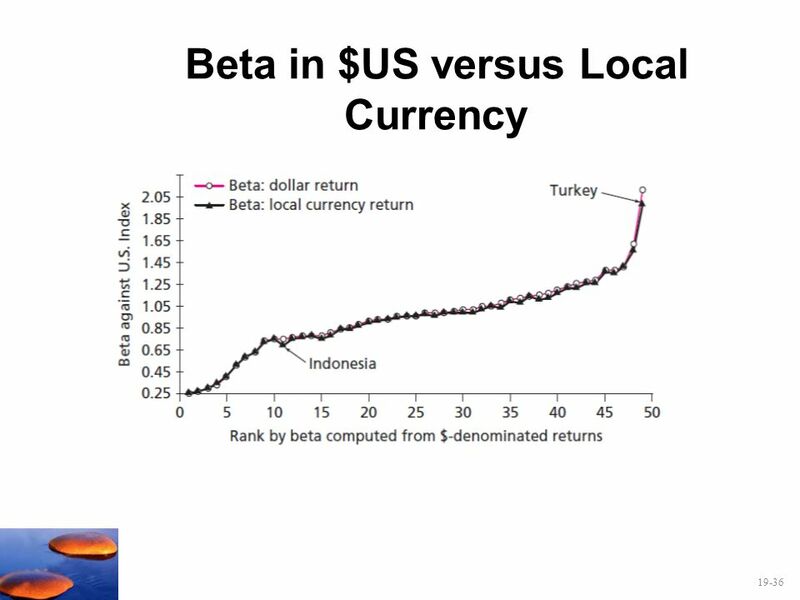 Betas are also only slightly lower for local currency returns. The reason for this is in the next slide. 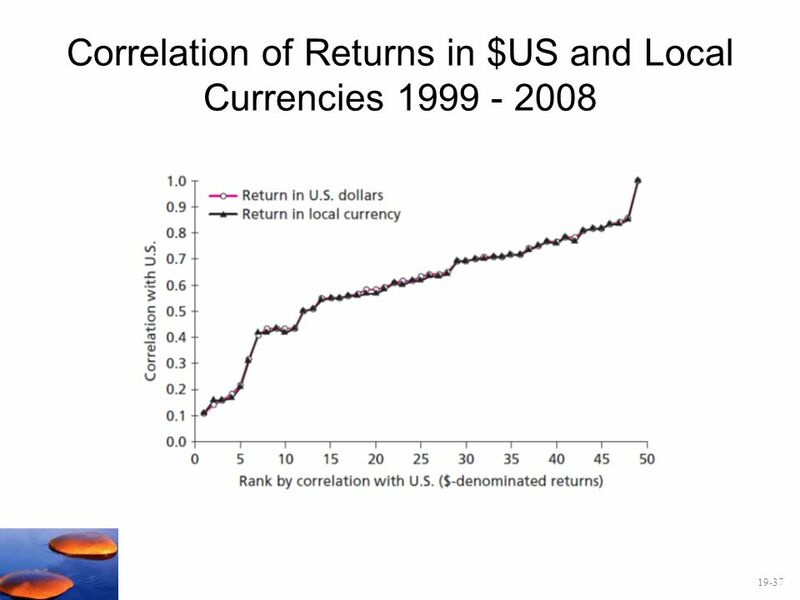 Notice the nearly identical correlations of country returns with U.S. returns in U.S. dollars and in local currency returns. 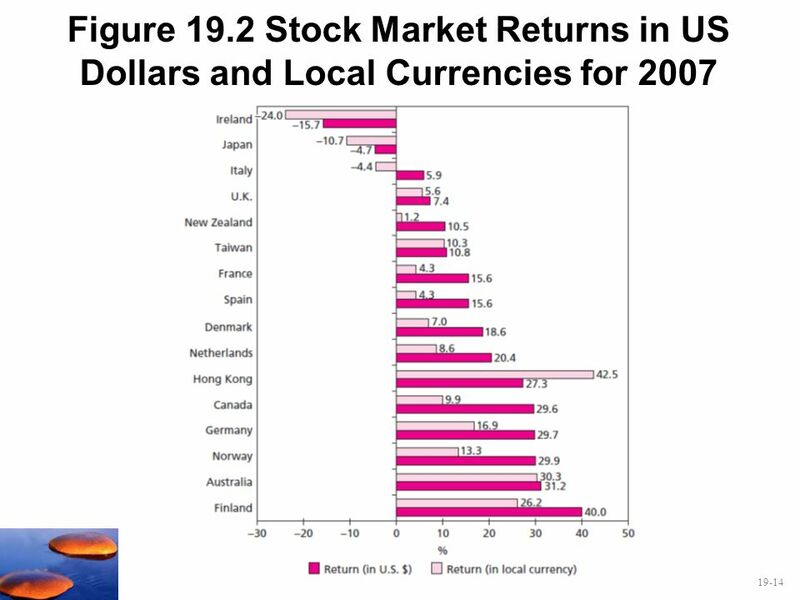 In 1999 the dollar appears to have been overvalued since over the following 10 years, returns in local currency (which may be considered hedged returns so that the change in the value of the dollar did not affect performance) outperformed unhedged returns (returns when converted to U.S. dollars). The point is that hedging currency risk can materially affect returns, particularly if a currency is over or undervalued against many other currencies. The choice to hedge or not now becomes one of the decision variables for an active manager. 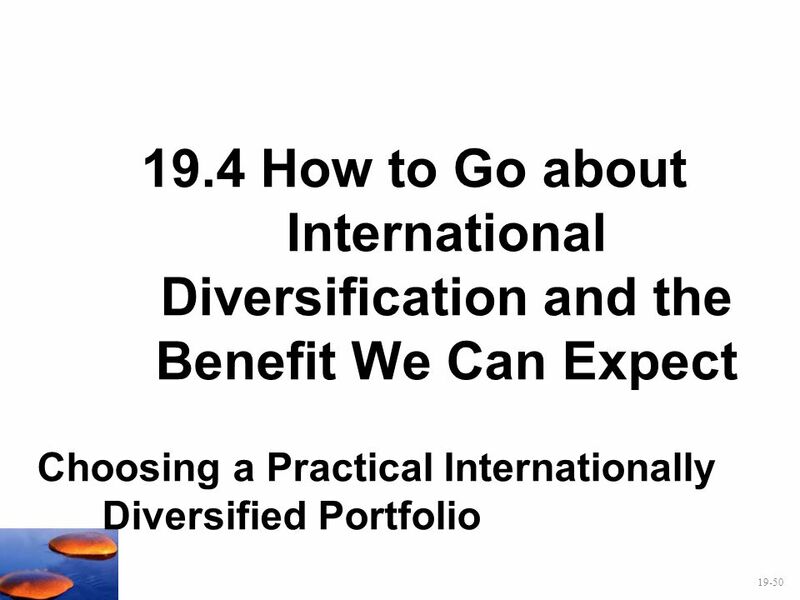 Are there diversification benefits to international investing? International Diversification. 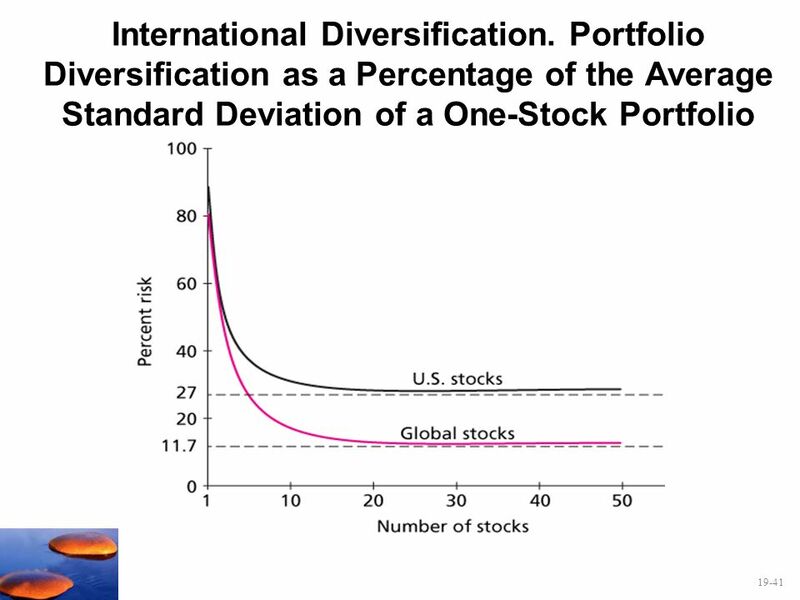 Portfolio Diversification as a Percentage of the Average Standard Deviation of a One-Stock Portfolio Diversifying internationally eliminates about another 15% that is certainly economically material but this is from dated results. 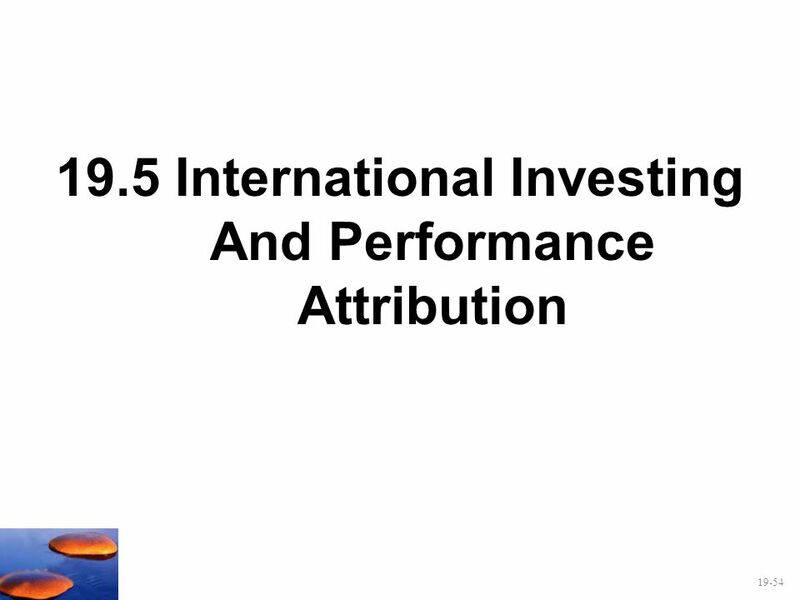 These correlations indicate that international diversification benefits will be significant and material. Note the negative correlations between bonds and stocks. This indicates that adding bonds to a portfolio will result in substantial diversification benefits. Unfortunately the authors did not update this graph. 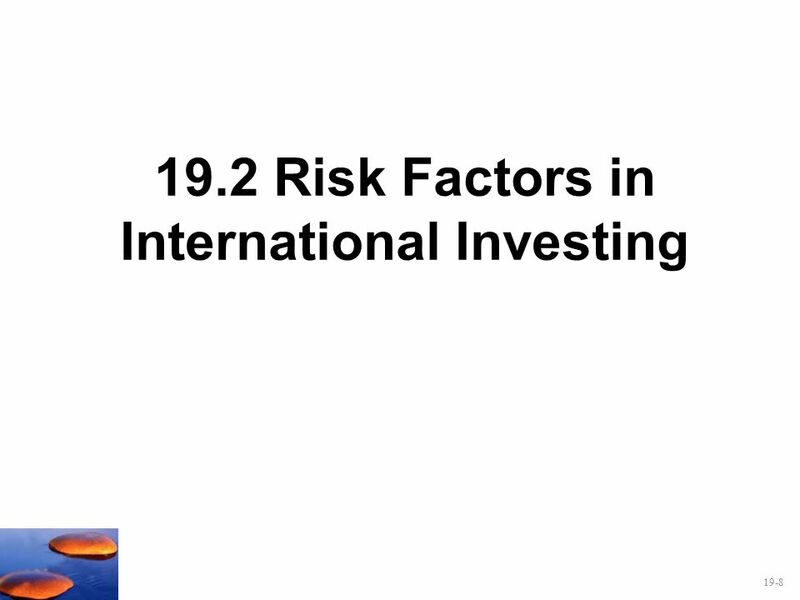 However it indicates the benefits of international investing. 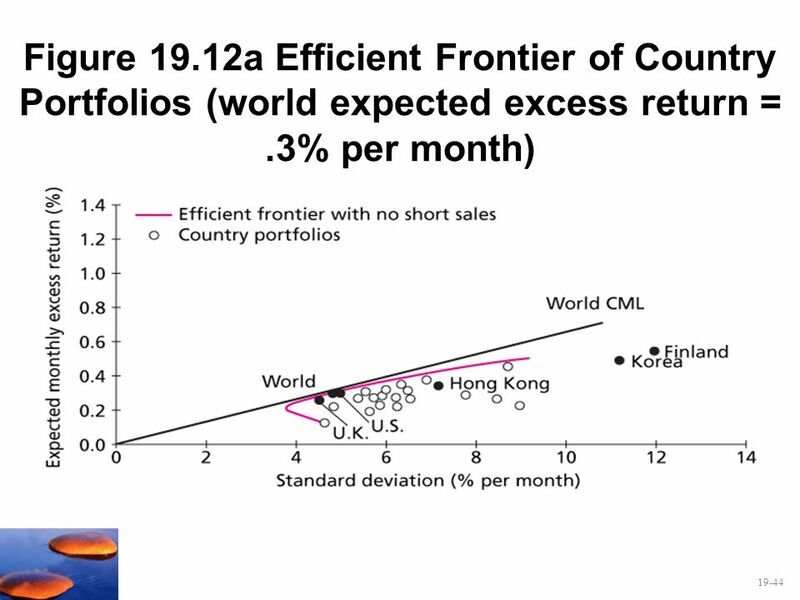 44 Figure 19.12a Efficient Frontier of Country Portfolios (world expected excess return = .3% per month) This graph indicates only modes benefits from international diversification from including developed markets. 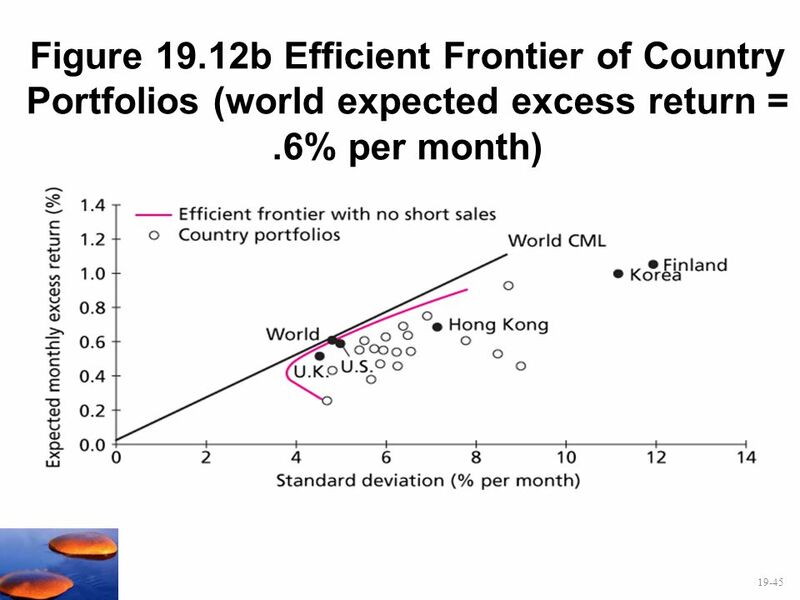 45 Figure 19.12b Efficient Frontier of Country Portfolios (world expected excess return = .6% per month) Changing the expected excess return in this way makes the slope of the CML larger because a higher excess return simply shifts the curve upward. 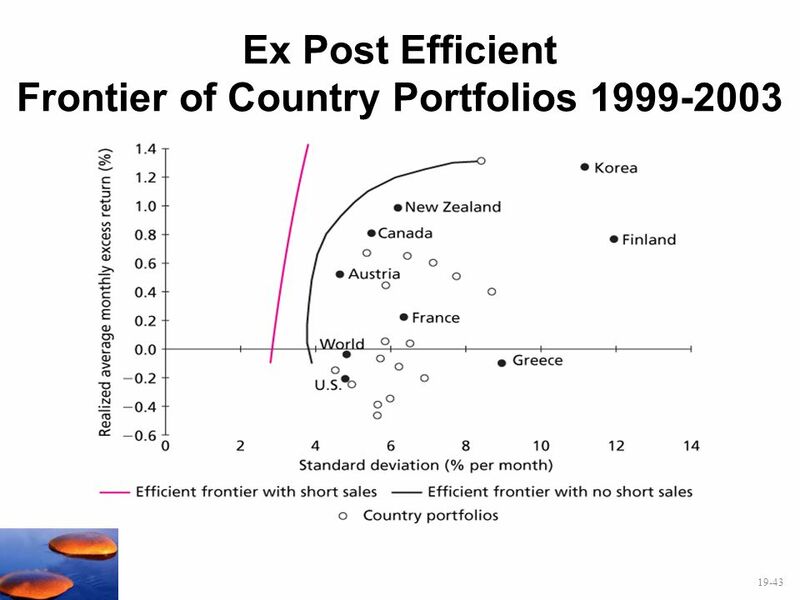 This graph also indicates only modest benefits from international diversification from including developed markets. 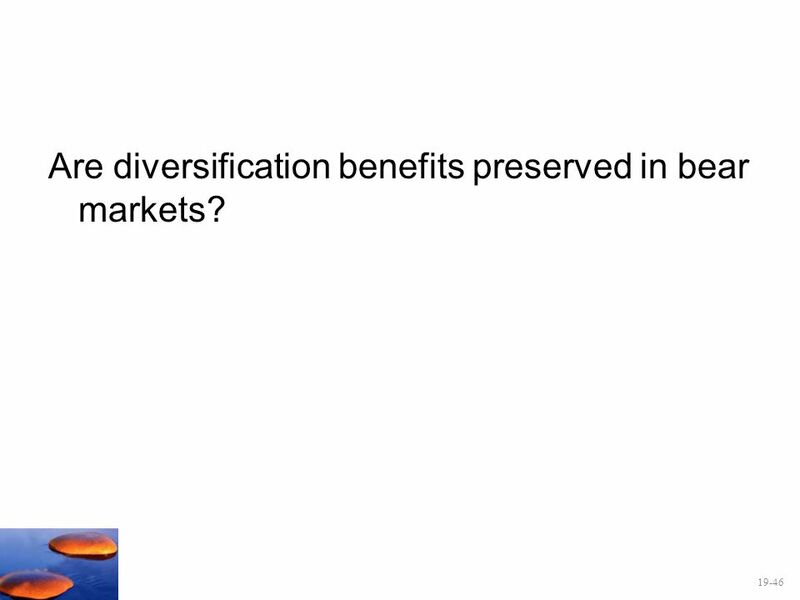 46 Are diversification benefits preserved in bear markets? There is an old saying that in a crash ,“All correlations go to 1.” If so then diversification fails just when you need it most. This was certainly true for the hedge fund Long Term Capital Management. We should note that this is from Richard Roll’s work. As you might expect, some events affect all stocks globally and you can’t diversify away from those factors. Some macro shocks such as the financial crisis of 2008 are likely to tank all stocks, though not all equally. 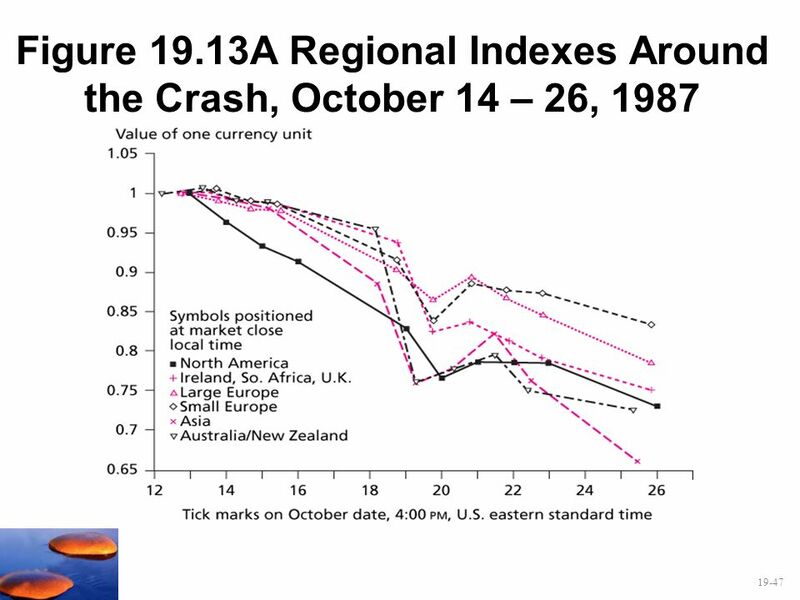 Roll (1988) found that the beta of the country index on the world index predicted that index’s response to the ‘87 crash. 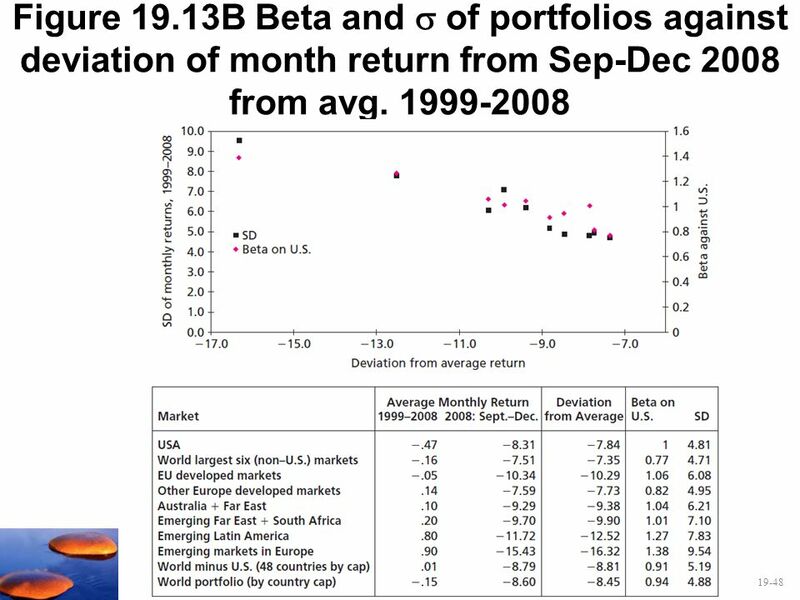 48 Figure 19.13B Beta and  of portfolios against deviation of month return from Sep-Dec 2008 from avg Both beta against the U.S. and the country index standard deviation explain the deviation of crisis returns from the overall period averages. This largely confirms Roll’s predictions. 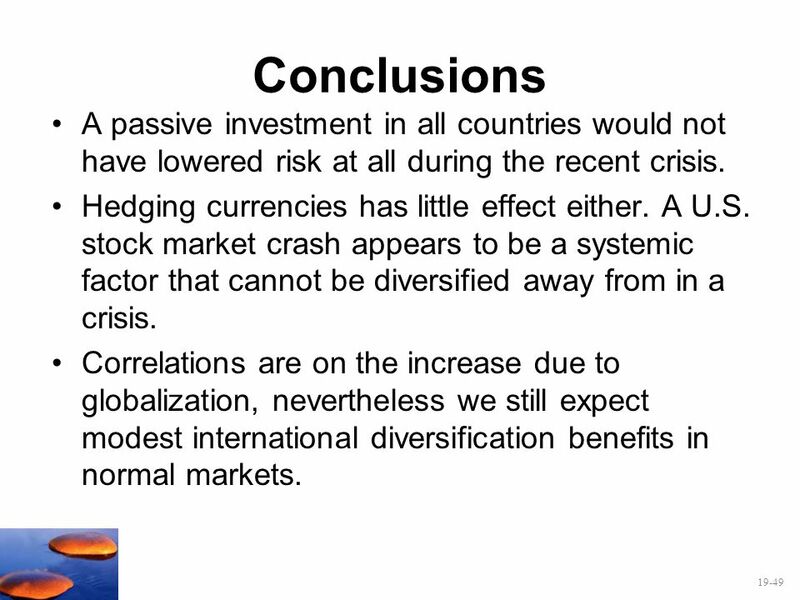 49 Conclusions A passive investment in all countries would not have lowered risk at all during the recent crisis. 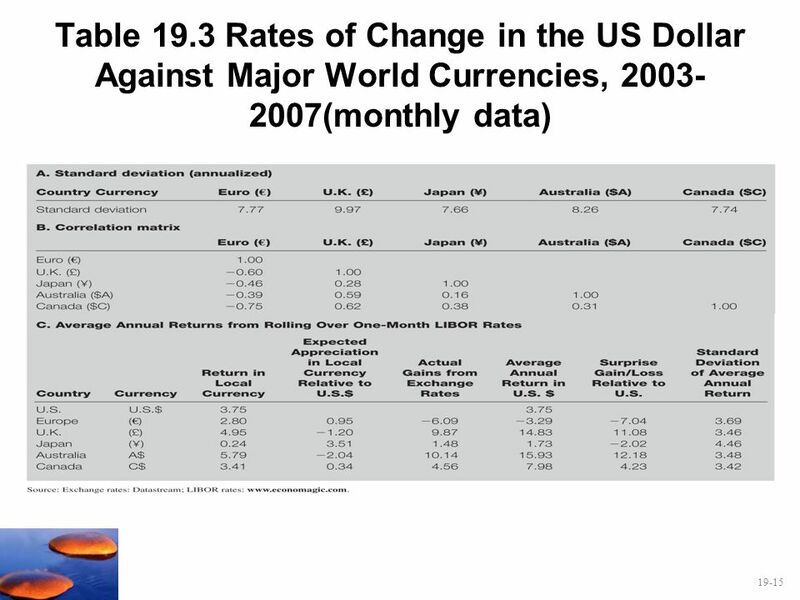 Hedging currencies has little effect either. A U.S. stock market crash appears to be a systemic factor that cannot be diversified away from in a crisis. 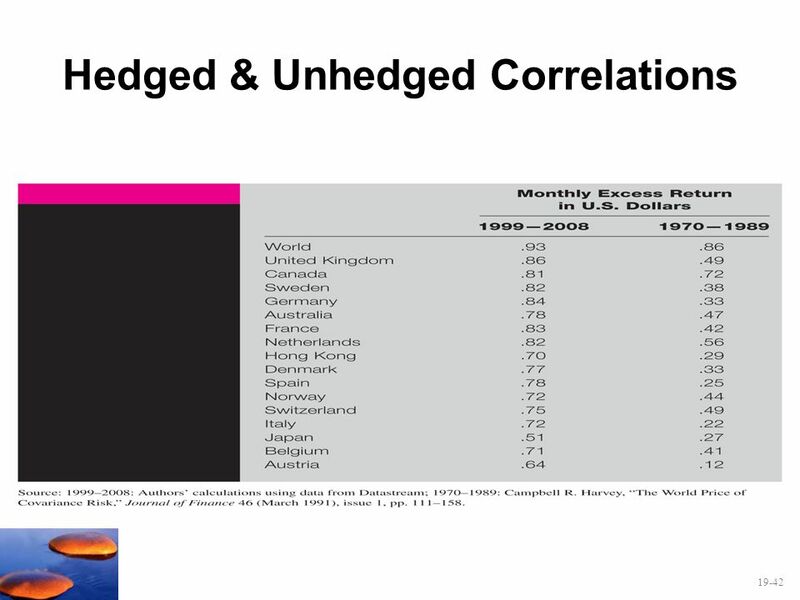 Correlations are on the increase due to globalization, nevertheless we still expect modest international diversification benefits in normal markets. 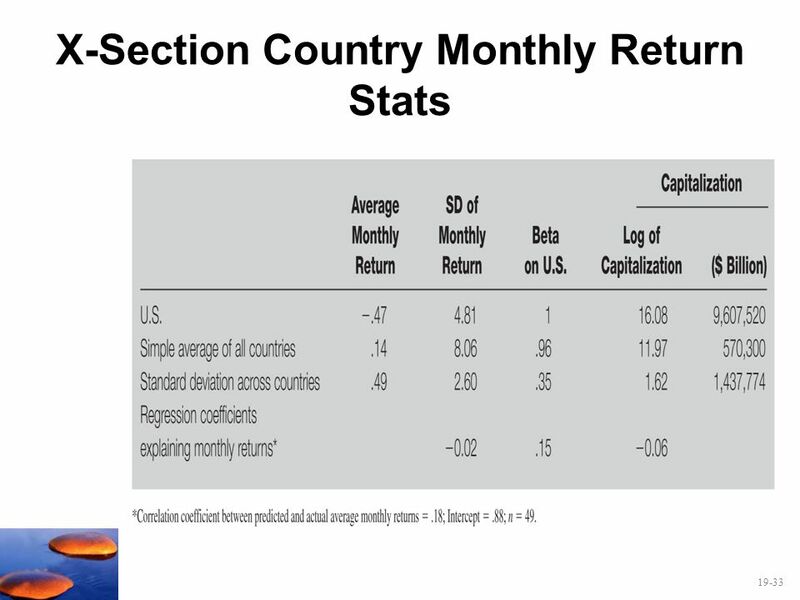 The U.S. only standard deviation (SD) of monthly returns is 4.81%. 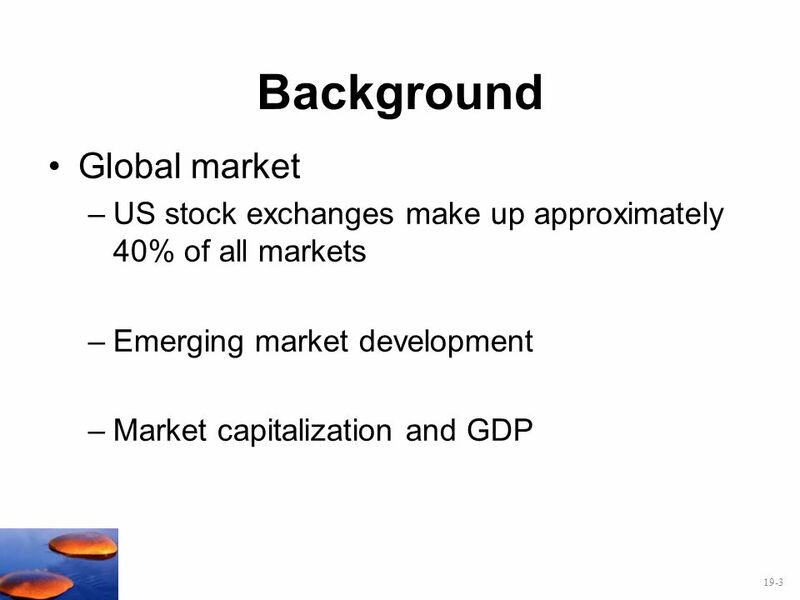 The minimum variance portfolio is to diversify into all countries and allows short sales. This yields a SD of 1.9%. Disallowing short sales, moves the SD to 3.44%, still quite low. 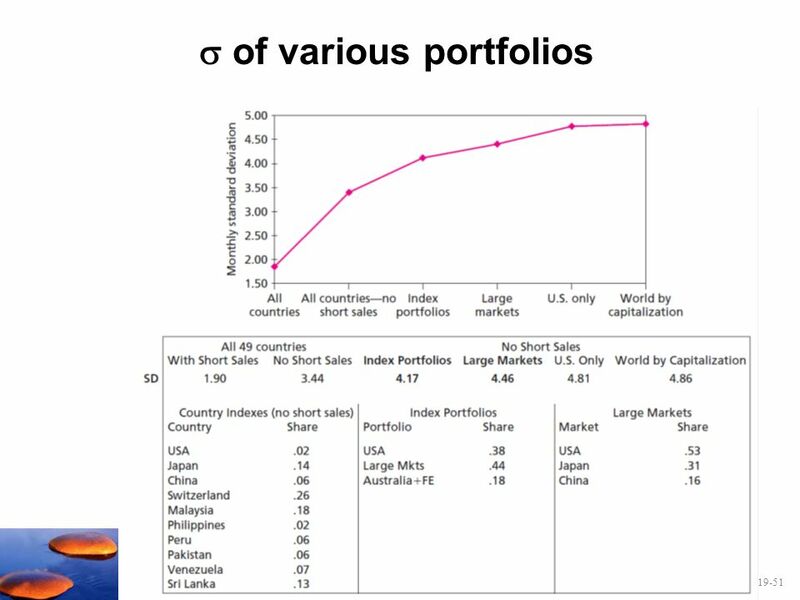 The problem with this portfolio is that the U.S. comprises only 2% of it while risky countries like Malaysia and Sri Lanka comprise 31% of the portfolio! Nobody is going to invest that way, because we know it is too risky. 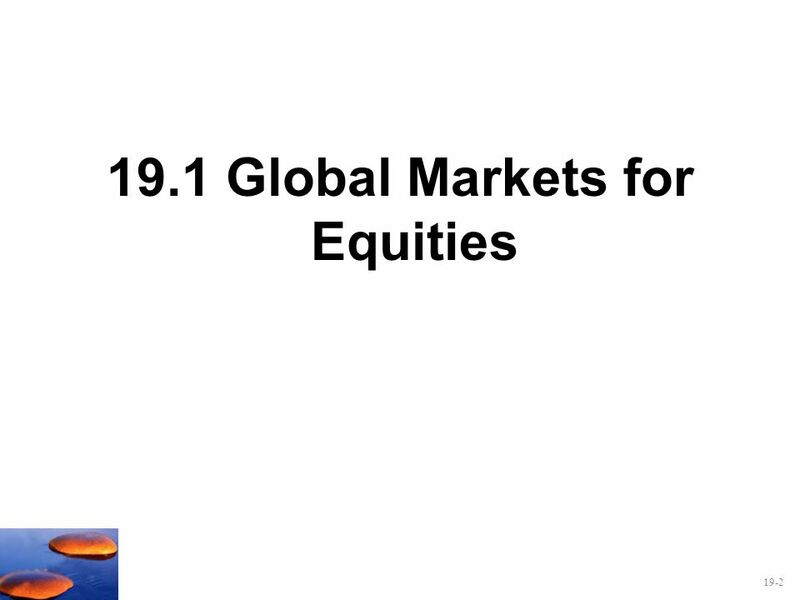 The index portfolios consists mostly of large markets (44%) and Australia plus the Far East (18%). The two large markets added are Japan (31%) and China (16%). 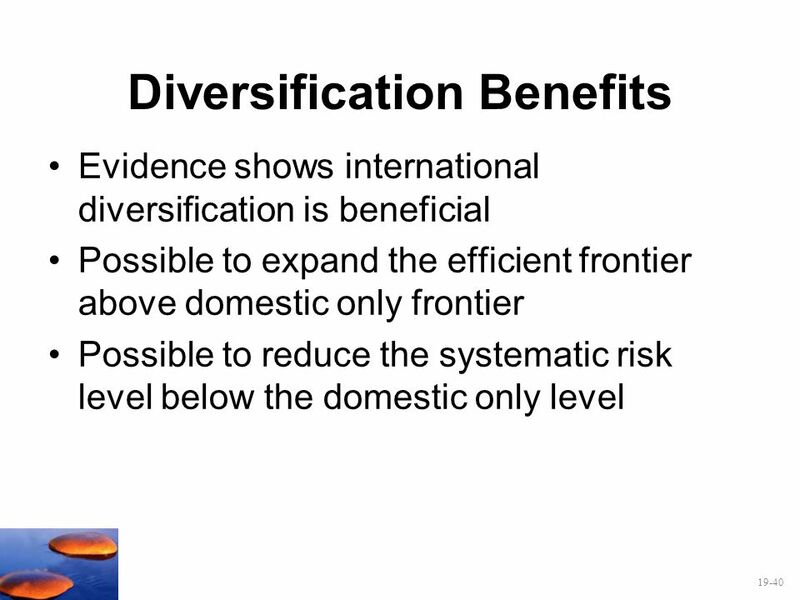 According to these results passive international diversification is less effective than generally thought. 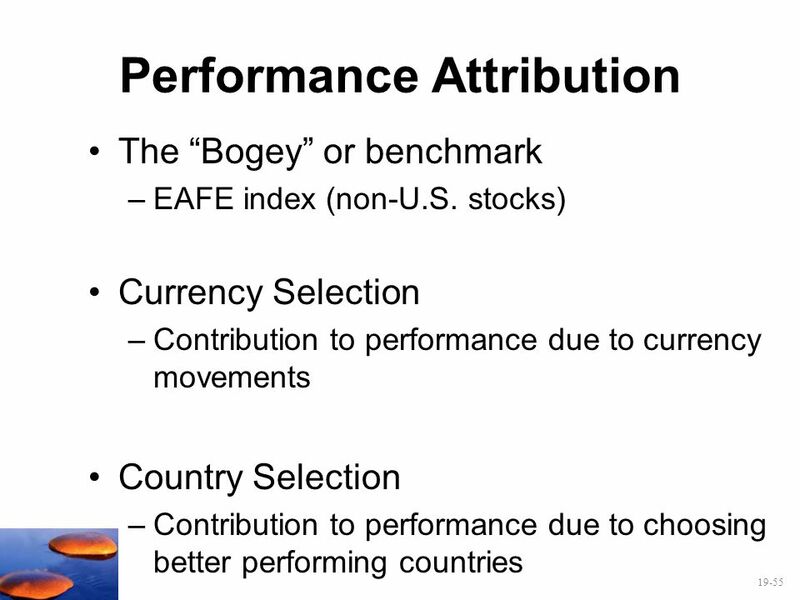 Security selection and asset allocation within each market to identify a country portfolio superior to country index. 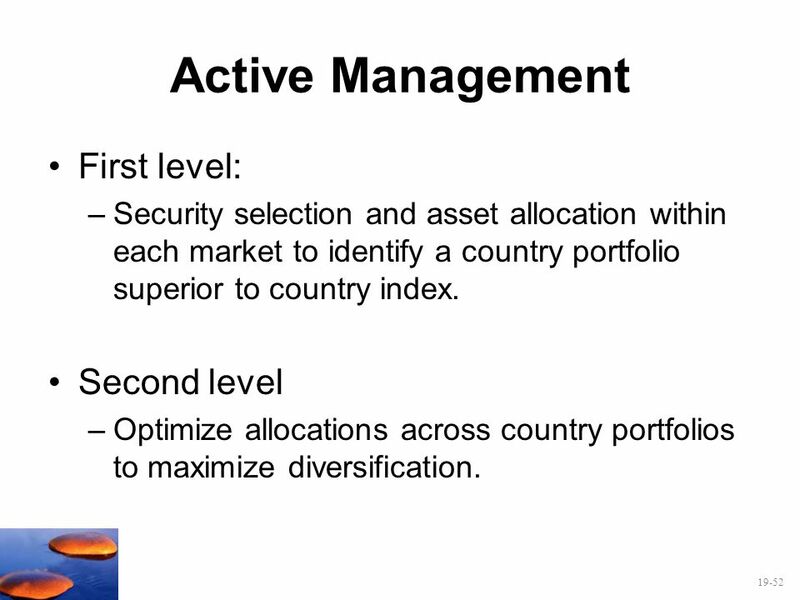 Second level Optimize allocations across country portfolios to maximize diversification. 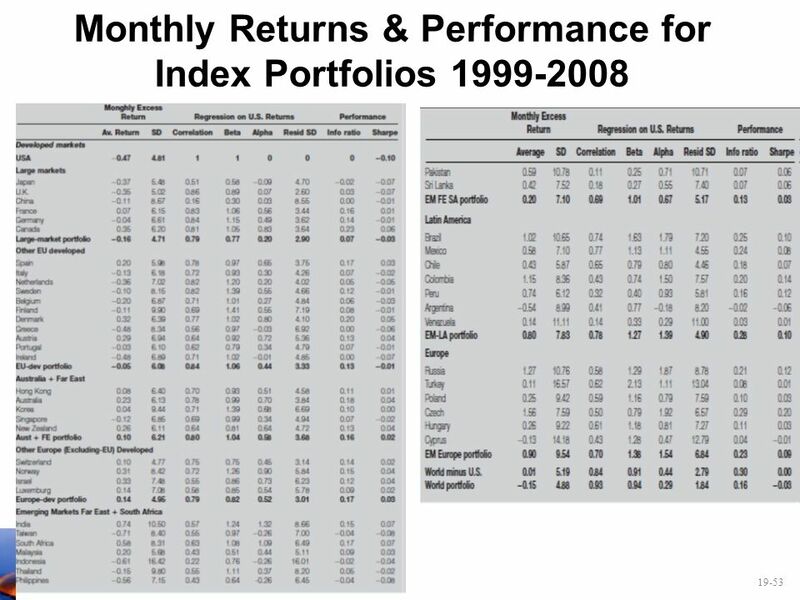 The alphas and information ratios in Table 19.9B (next slide) indicate that even noisy forecasts of these variables may be able to generate portfolios with greatly superior performance. The alphas and information ratios in Table 19.9B indicate that even noisy forecasts of these variables may be able to generate portfolios with greatly superior performance. 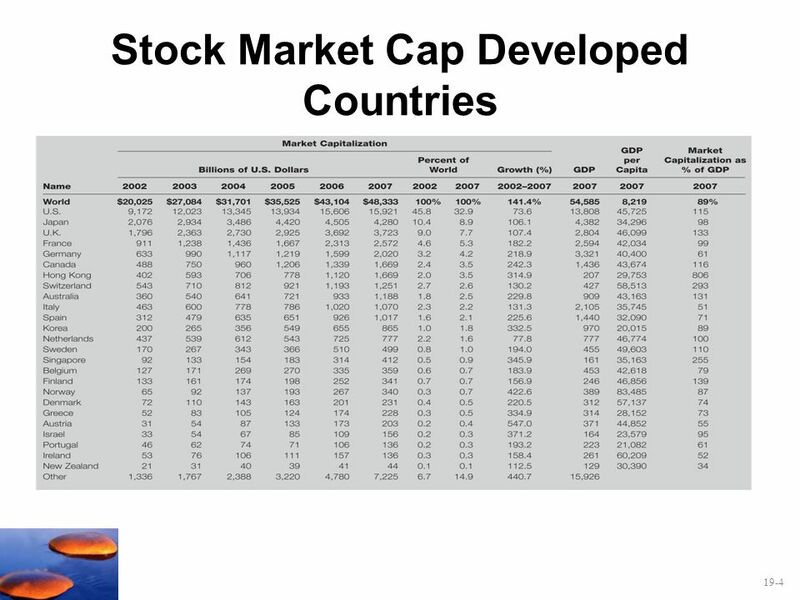 Stock Selection This ability is measured as the weighted average of equity returns in excess of the equity index in each country. 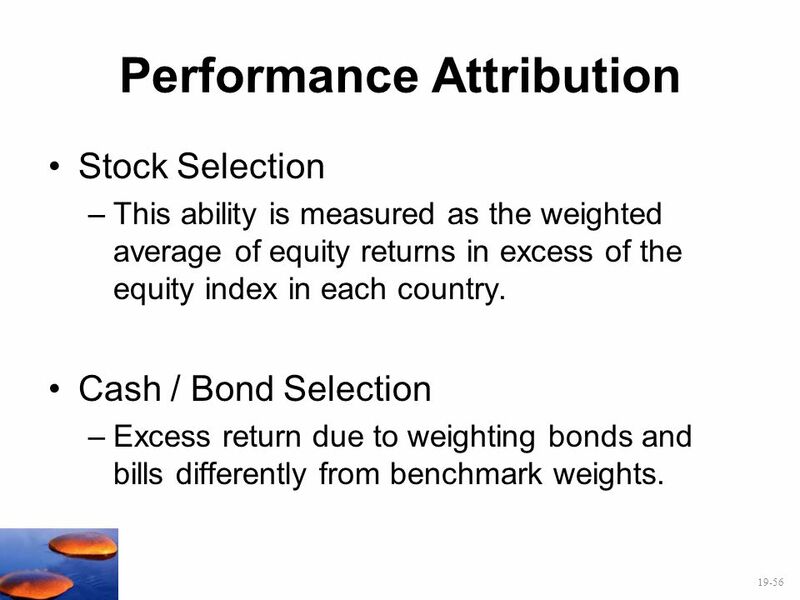 Cash / Bond Selection Excess return due to weighting bonds and bills differently from benchmark weights. 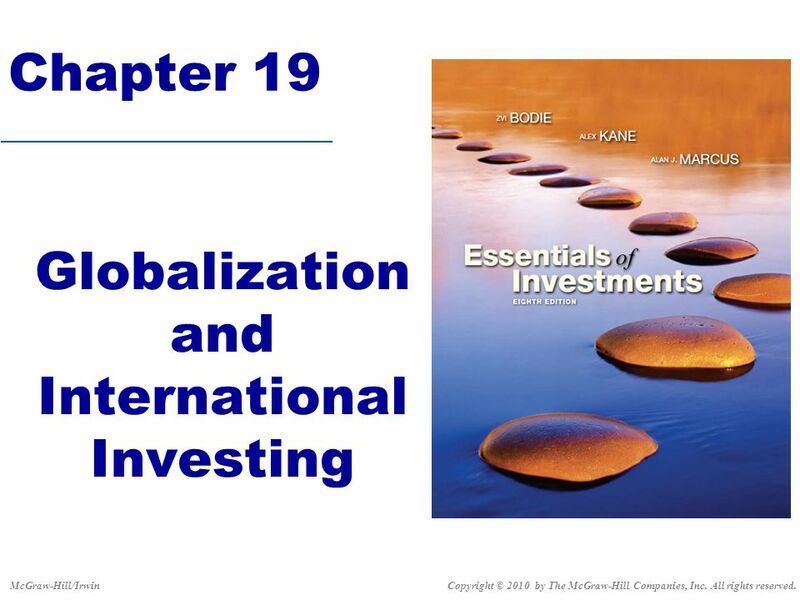 Download ppt "Globalization and International Investing"
6 - 1 Copyright © 2002 by Harcourt, Inc All rights reserved. CHAPTER 6 Risk and Return: The Basics Basic return concepts Basic risk concepts Stand-alone.